The Taj Garage: Australia Day! 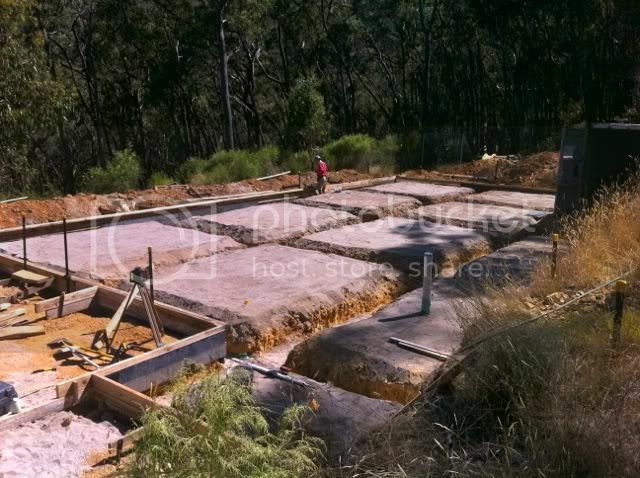 It’s Australia Day, and while we’d prefer to have been sitting back on our freshly laid slab enjoying a cold cider and a lamb chop, instead Peter and I got down to work setting up the site for the pour on Saturday, to the tunes on the Hottest 100. Peter had been onsite most of the week setting up the forms, but we still had the heavy work to do in setting up the steel. This is what we started with this morning. All the sand is packed, and nearly all the form work set up. We still have a little to do around the container and along the cutting wall, but that shouldn’t take long and then we can get into laying the plastic and steel.